There is nothing more important to us as parents than for our children to be proud of who they are. We encourage children to hold steadfastly to their values, to treat everyone with respect, to celebrate the joy of being Jewish, and develop a wealth of inner resources that will enable them to grow and mature. In order for children to be proud of their heritage, they must be able to understand it, love it, and be comfortable with it. Our students begin learning Hebrew in kindergarten when they are taught the Hebrew letters and vowel recognition. They progress to reading words and sentences, developing vocabulary, and increasing comprehension. 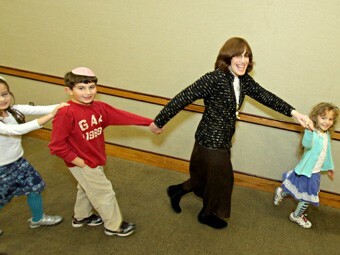 We are very fortunate to have a Hebrew whole language immersion curriculum. This program is taught in a Hebrew immersion classroom and includes all of the components of Judaic teachings, reading, writing, language, Torah, and holidays and rituals. Yes, in the beginning the children think that they are in a foreign country, but in a few weeks they are enthusiastically responding in the Hebrew language. With continuing instruction, many of the students are able to write stories in Hebrew, converse, and read fluently. We also utilize our skills in the study of Torah. Since the Torah is the basic foundation of Judaism, we feel that it is important for the children to be exposed to the original text, which is written in Hebrew. 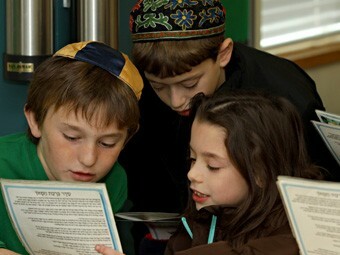 The skills that we teach allow the children to further explore the many treasures contained in the Torah. We begin teaching the Torah in the second grade, using the actual Hebrew text. A large percentage of Parsha is devoted to the lives of our ancestors. We strive to present our ancestors, the patriarchs and matriarchs, as models from whom we can learn. For example, we are all familiar with the story of Moses and the Burning Bush, when G-d commands Moses to lead the Jews out of Egypt. When relating this story, we emphasize that, at this particular time, Moses was working as a shepherd. One day when he was herding sheep, he rescued a single straying sheep – a sheep that would otherwise have been lost from the flock. By rescuing that sheep, Moses showed his concern for each of the creatures in his flock. We help the children recognize and understand Moses’ compassion and love and hopefully incorporate that compassion and love in family relationships, friendships, and each aspect of their own lives. 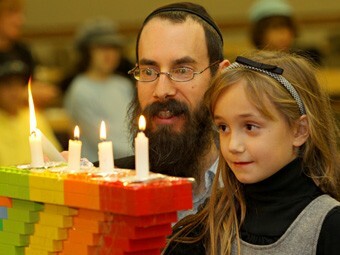 The younger children begin by learning about the origin of the Chanukah menorah. They learn about the one-day supply of oil miraculously lasting for eight days. They are then ready to learn how to recite the blessings that precede the lighting of the menorah. We know that children learn and remember best through hands-on experiences, so the children design functional menorahs and actually press olives to produce olive oil for their handcrafted menorahs. As the children mature, we focus on the message of the lights. Just as we mark each new day of Chanukah by adding another candle, so must we constantly strive to add light and warmth to our surroundings. We further encourage the children to apply their critical thinking skills by challenging them to understand not only what we do or what happened, but also why we celebrate in the manner that we do. For example: Why is Chanukah the only holiday that is not celebrated with a festive meal? And why is the miracle of the great military victory barely mentioned and certainly not included in the practices of the holiday? These thought-provoking questions help the children gain a complete understanding of the holiday, from the when to the what, and then to the why.